Willie, pictured here with his family is not just a keen, professional photographer but indeed one who is forever in pursuit of the ultimate photo. When not shooting photographs he is attending courses and meeting with some of the worlds top photographers. Both Angie and Willie are accredited photographers and are fully qualified members of the Society of Wedding and Portrait Photographers. 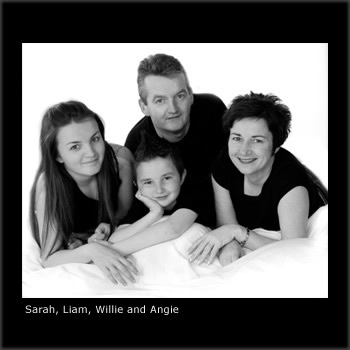 William and Angela have experience in all aspects of photography having completed National and International commissions. They both that you enjoy the photographs displayed here on the site and would be pleased to speak to those of you who wish to arrange a shoot.